Culture & the Creative Economy: What Opportunities for Asia-Europe Collaboration? What future for information & communications technology (ICT) within the creative economy? Traditional cultural heritage & the creative economy: shall the twain meet? What are areas of common interest for Asia-Europe co-operation in the creative industries? These questions are high on the agenda of Asian and European Culture Ministers who will meet at the 7th ASEM Culture Ministers’ Meeting (ASEM CMM7; 22-24 June 2016, Gwangju, Korea), being organised in the framework of the Asia-Europe Meeting (ASEM). To channel civil society inputs into this Ministerial meeting, ASEF is organising a panel discussion: Culture and the Creative Economy: What Opportunities for Asia-Europe Exchange and Collaboration? (22 June 2016, Gwangju, Korea), alongside the 2nd Senior Officials Meeting (SOM) of ASEM CMM7. Key messages from the panel discussion on 22 June will be presented to ASEM Culture Ministers on 24 June. As the only permanent institution of ASEM, ASEF has an important function in connecting the views and concerns of civil society in Asia and Europe with reflections at the ASEM level. The Concept Note and Programme of this ASEF Policy Panel are available in the Documents section of this web page. ASEF complements the intergovernmental dialogue at the Asia-Europe Meeting (ASEM) by engaging civil societies of both regions. In line with this mandate, an ASEF Policy Panel was organised at the 7th ASEM Culture Ministers’ Meeting (ASEM CMM7) on 22 June 2016 in Gwangju, Republic of Korea. This panel on Culture & the Creative Economy: What Opportunities for Asia-Europe Exchange & Collaboration? brought together three cultural experts: Dr Amareswar GALLA, Executive Director, International Institute for the Inclusive Museum; Mr Ossi LUOTO, CEO, Europe-Asia Roundtable Sessions (EARS); and Mr Jérémy SEGAY, Specialist in Asian cinema & Audio-visual Attaché, Bureau Français. The panel was moderated by Ms Anupama SEKHAR, Director, Culture Department, ASEF. Three key ideas were offered by the panellists to the representatives of the 53 ASEM Partners attending ASEM CMM7. First, ASEM governments must support the creation, distribution and consumption of diverse cultural content (be it films or books) by enabling public policies. Secondly, care must be taken to ensure equal partnerships between Asian and European artists and organisations within collaborative projects. Thirdly, peer-to-peer networking as well as intergenerational mentoring must be reiterated through face-to-face exchanges. A short video on the ASEF Policy Panel can be viewed here. The report of the ASEF Policy Panel is available here. As ASEM commemorates its 20th anniversary, ASEM CMM7 focused on Asia-Europe cultural collaboration in heritage and the creative industries. This ministerial meeting, held from 22-24 June 2016, acknowledged the challenge of maintaining the integrity of cultural heritage, while attempting to harness the potential of the cultural and creative industries. 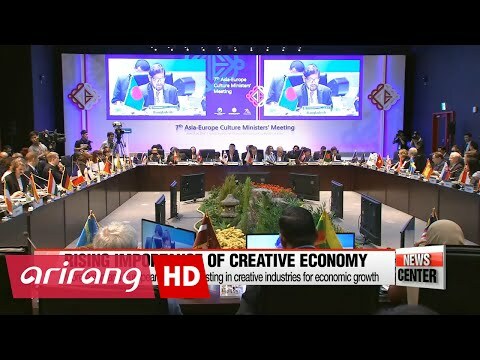 Ministers underlined the importance of using new technologies to further develop national creative industries and particularly stressed the importance of collaboration on the creative industries within the ASEM context. ASEF’s significant role in reinforcing the Asia-Europe Meeting (ASEM) process was re-emphasised at the 7th ASEM Culture Ministers’ Meeting on 22-24 June 2016 in Gwangju, Korea. The Ministers commended ASEF’s efforts in facilitating bi-regional dialogue in arts and culture among the 53 ASEM partners. In particular, the Ministers valued the ASEF Public Forum and ASEF Policy Panel Series in translating key recommendations of ASEM Culture Ministers’ Meetings into concrete activities involving the civil society. ASEM Culture Ministers similarly recognised the role of the ASEF’s arts and culture portal, culture360.asef.org, and the specialised website on museums in Asia and Europe, asemus.museum, in connecting museums in the two regions. In conjunction with the Ministerial Meeting, ASEF also presented the 2nd edition of the publication “Cities: Living Labs for Culture? Case Studies from Asia and Europe”, a collection of 27 case studies of policies and practices in culture and the creative economies in the context of 40 cities in 44 Asian and European countries. The Asia-Europe Foundation (ASEF) will co-organise a panel discussion with civil experts titled “Culture and the Creative Economy: What Opportunities for Asia-Europe Exchange and Collaboration?” on 22 June 2016, alongside the 2nd Senior Officials Meeting (SOM) of the 7th ASEM Culture Ministers Meeting (ASEM CMM7) on 23-24 June 2016 in Gwangju, Korea. The ASEM CMM7 attendees will discuss issues, trends and challenges relating to culture and the creative economy. The agenda of this Ministerial meeting builds on the on-going dialogue around Asia-Europe exchange and collaboration in creative industries and cultural heritage at previous ASEM Culture Ministers’ Meetings (2014, Netherlands; 2012, Indonesia; 2010, Poland). An ASEF panel discussion will follow closely the topics of the Ministerial meeting, namely the future of information and communication technologies (ICT) in creative industries; traditional cultural heritage and the creative economy; and international cooperation for revitalising the creative industries. The panel discussion will highlight good practices from Asia and Europe and identify opportunities and challenges for Asia-Europe collaboration in the creative industries. By addressing these issues, the panel hopes to offer some ‘food for thought’ for the Ministerial meeting. Key messages from the panel discussion on 22 June will be presented to ASEM Culture Ministers on 24 June 2016.